Ah, the good old DVD. I used to think it was such an easy way to deliver images to my clients from their sessions. I’ve been doing that for over 5 years. But over time, it became tedious. Tiring. I had to get the printer ready, hope that it would behave and print my custom DVD label, get the rest of the packaging ready, and then do it all again. Making DVDs was so time consuming! Then I purchased my MacBook Air. Guess what Apple did? They removed the DVD drive from the laptop! I have an iMac as well, so I can always use that one, but it was then that I realized that I haven’t actually physically put a DVD in to a computer in a few years, with the exception of making DVDs for clients. 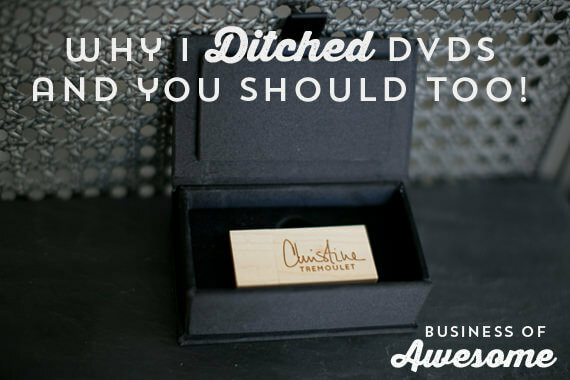 I knew it was time to ditch the DVDs! More and more, your clients are buying computers that do not have DVD drives. They have other devices that they would like to store images on as well – their iPads, Android tablets, and things like that. Providing them with their image files on USB drives just makes so much more sense! I first discovered PhotoFlashDrives at WPPI a few years ago. I immediately fell in love. Their staff was so amazingly nice as I asked them a ton of questions about their drives, so I knew when I was ready to switch from DVDs to USBs exactly where to go. I have purchased both my USB thumb drives and my black boxes from PhotoFlashDrives. The boxes have a nice hinged lid, and the insert is cut to perfectly fit they square wood USB thumb drive. They have an endless range of options for both USB drives and for packaging on their site. You can choose to have additional engraving on the other side of the drive as well, also for free! You might want to put your client’s name and the date of the session? There is limited character space, but maybe “With Love” and your client’s name for when they give it to their sweetheart? I have been beyond thrilled with these drives! Two thumbs up. Five out of five stars. However you want to rank them, they are excellent! A Great Deal for Photographers! Photographers get great deals on products via the PhotoFlashDrive website (USB thumb drives, packaging, client gifts, print boxes, and so much more) all the time by using the links in this post. My boudoir sessions would easily fit on a 2gb USB Flash Drive, however I order the 4GB drives. When my clients purchase the high-resolution photographic image files, I give them image files in full size for them to print, and web-ready size with my watermark for them to use online if they would like. I also provide them with the Animoto slideshow I have made from their session, so that allows me to have room for that. I only photograph weddings now by referral, but for those clients I purchase the 16gb thumb drive, just to make sure there is enough room for everything. Better to have too much space than too little! PhotoFlashDrive offers great instructions with their ordering process on what files they accept and the size information. I sent in an EPS file, which is a vector art format and can be easily scaled up or down with no resolution losses. You can opt for a digital preview to be emailed to you when you place your order. Once I placed my first order, they assigned an artwork number for that design (the one featured here) and now I can enter that number with each future order and know that it will be placed exactly the same way and the same size. How Long Does It Take to Receive the Flash Drives? This will vary in part depending on which shipping option you select, but I have found it takes approximately two weeks to receive the drives. This allows them time to do the custom engraving on them, in addition to getting them to you. Plan ahead, or choose to pay the upgrade charge to rush your order through; they will then go out in 1 business day and you will receive them in 2-3 days (or longer) depending on your shipping option you choose. It was very important to me that I had packaging that matched my existing brand for my USB Flash drives. I currently use ProDPI’s eco-friendly packaging for my prints and albums, and paper and totes from Paper Source for my thank you notes and presentation bags. 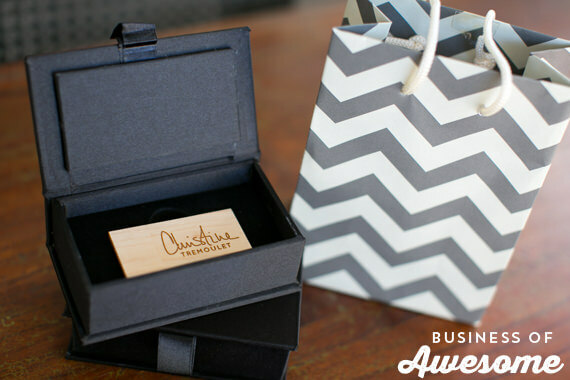 The totes come in the perfect size to put a USB thumb drive box in – which makes a perfect presentation for my clients! While PhotoFlashDrive has a number of options for packaging, I chose to go with their black silk boxes with the custom cut insert for the square wood flash drives. It offers what I felt was the best look for my brand. I like the light wood of the Maple flash drives with the kraft paper boxes that I also use. 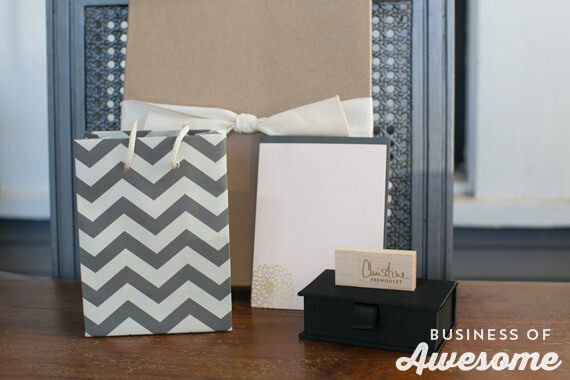 You could look for jewelry boxes, metal tins, and other items to use for your packaging. There are so many options out there! Just make sure it fits with the rest of what you offer and the feel that you want your brand to have for your clients. Have you switched to USB Flash drives or thumb drives for your clients yet? What do you love about them? Please share in the comments! Visit PhotoFlashDrive to get great prices on all USB drives all the time by using the links in this post. DISCLOSURE: There are affiliate links in this post for PhotoFlashDrive. 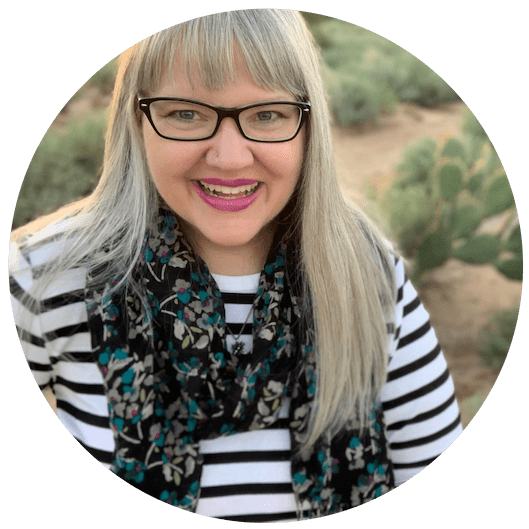 I will receive a small commission on purchases made through them; that money goes towards keeping the site up and running and supporting my travel habit. I was not paid to write this post, and all opinions in this post are my own. I paid full price (minus any coupons they had at the time) for all products featured in this post. Thanks so much for this awesome the post Christine!! I’ve been looking for usbs and cute boxes! Wonderful! I wanted to order some flash drives, but I was not able to get the 40% discount to apply. That is such a superb way of providing customers with digital content! Yes we ditched DVDs a few years back too and have been using dropbox, but wow beautiful drives in a nice box don’t half leave dropbox wanting. On thing I was wondering – you mentioned iPads. They don’t have USB ports and it drives me crazy – have you found anything that does for all modern devices? That’s why we’ve been dropboxing, but hotdoggity your standards of presentation has got me rethinking. Alison, I’ll test them again, but with the USB Camera attachment, the thumb drives should work with the iPad. I’ll let you know for sure as soon as I get it out and try it! 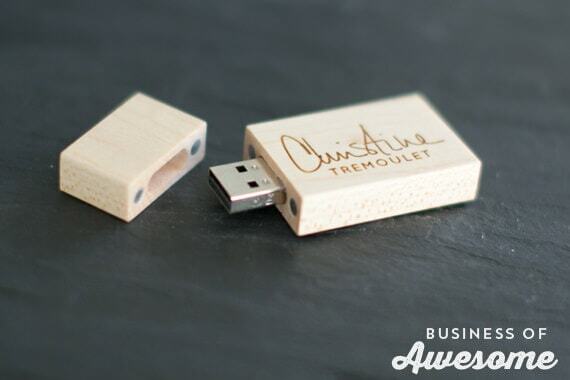 Those wooden USB drives are *hawt*! Thanks for sharing the resources, very deluxe and focused on the way we live/work/share photos now. Christine, I love these. Your logo goes so well with them. Very stylish! and up-to-date! Thanks! I just placed my order with Pexagon! Now on to find packaging! Thank you for your review. My friend Khara Plicanic recommended these but I find it’s always helpful to read a few reviews as well. Now I’ll order mine. Yeah! So excited to not have to burn any more CD’s! Just found your post …. loved it… and will be ordering! I haven’t used the drives before. Do you recommend giving clients Hi Res JPGs or TIFF files. Thanks Marcia! I always deliver JPG files, high resolution, not watermarked. That way, they can easily print them themselves. If they are photos they might post on Facebook (like headshots) I also deliver a “web-ready” version with my watermark small in the corner, and ask that they post those and not the full high-resolution ones. We were using dvds for backup and it was costing us more than it was worth and then we spoke to our web designer (they were doing are website at the time) and they recommended backing up to a flash drive so I went out and bought a 32gb flash drive from our local computer shop. 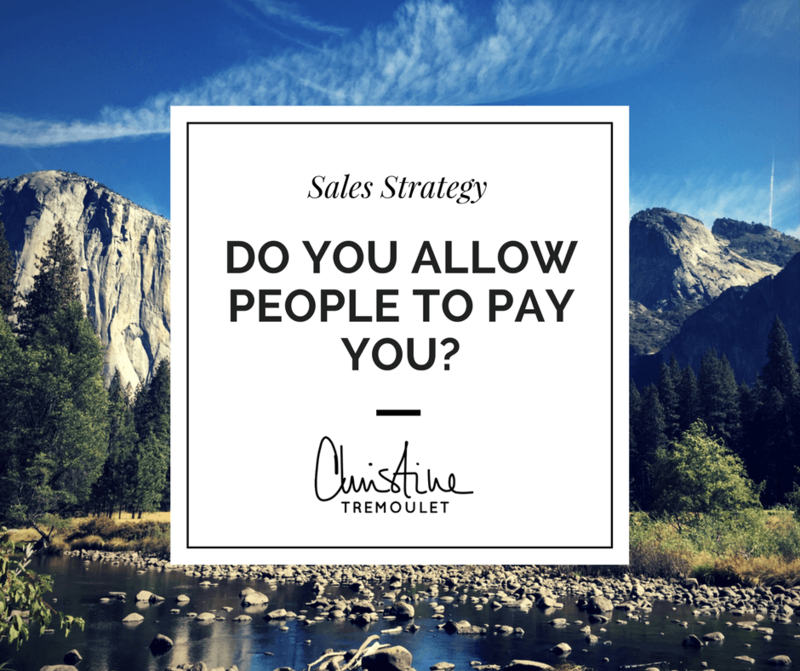 Great post, I’ve been looking for a company who can do this for my business (and deliver to Australia)! So glad I found your blog, thanks! Krystal, the 25% discount is automatic – it is 25% less than their other website. Hope that helps! It’s so interesting blog. I just love your USB design themes and the idea of box. USB Flash drive is an inexpensive method to store data. Now I will rush to buy it. Brand matters when commitment is to deliver USB Flash drives with high quality data storage and efficient performance. 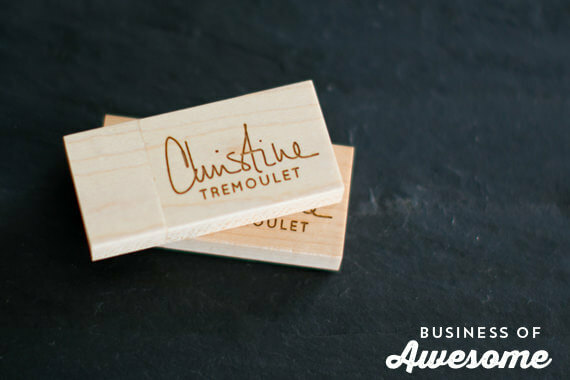 What a brilliant way to deliver the photographers’ artwork to their clients in an elegant custom wooden USB drive. I would recommend to my photographer friends. Great post! I am really inspired by packing of DVD and USB flash drives. Its stunning look is expressing that its performance will also be smooth.